A user sends an HTTP request to a web server on a remote network. During encapsulation for this request, what information is added to the address field of a frame to indicate the destination? What is a benefit of using a layered model for network communications? Which protocol is responsible for controlling the size and rate of the HTTP messages exchanged between server and client? Based on the configured network, what IP address would PC1 and PC2 use as their default gateway? A computer in a given network is communicating with a specific group of computers. What type of communication is this? What is a function of Layer 4 of the OSI model? Which IEEE standard enables a wireless NIC to connect to a wireless AP that is made by a different manufacturer? The host can communicate with other hosts on the local network, but is unable to communicate with hosts on remote networks. Which address provides a unique host address for data communications at the internet layer? A user is viewing an HTML document located on a web server. What protocol segments the messages and manages the segments in the individual conversation between the web server and the web client? Match the description to the organization. This organization is the largest developer of international standars in the world for a wide variety of products and services. It is know for its Open System Interconection (OSI) reference model. 23. 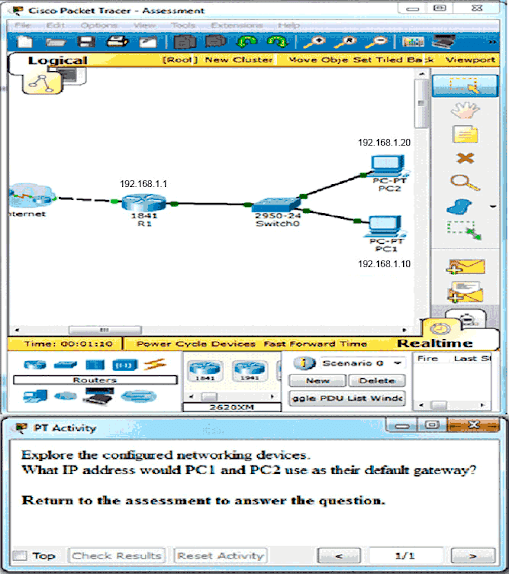 Which protocol is used by a computer to find the MAC address of the default gateway on an Ethernet network? 24. Refer to the exhibit. PC-A and PC-B are both in VLAN 60. PC-A is unable to communicate with PC-B. What is the problem? 25. Which command is used to remove only VLAN 20 from a switch? 26. Which statement is correct about network protocols? 28. Refer to the exhibit. If Host1 were to transfer a file to the server, what layers of the TCP/IP model would be used? 30. 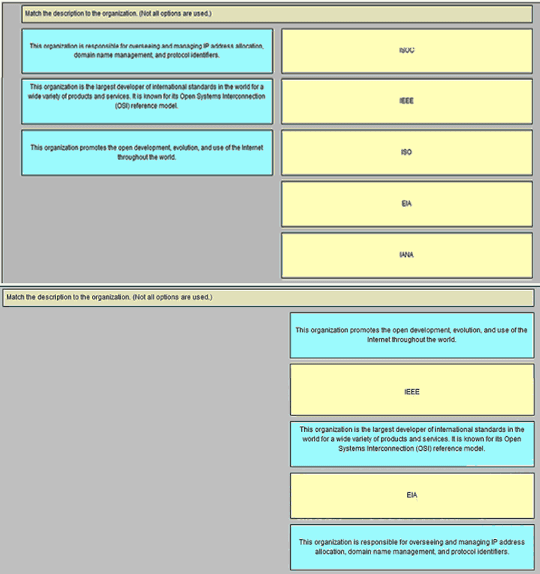 Which PDU is processed when a host computer is de-encapsulating a message at the transport layer of the TCP/IP model? 32. What will happen if the default gateway address is incorrectly configured on a host? 33. Which characteristic describes the default gateway of a host computer? 36. What type of communication will send a message to all devices on a local area network? 37. What process is used to place one message inside another message for transfer from the source to the destination? 38. What is an advantage of using standards to develop and implement protocols?